By Giving you a gift. A recent study by the Kamaron Institute found that partiotism runs strong in American households. In recognition of the Fourth of July holiday and in appreciation of military families and all that they sacrifice, we are giving away a downloadable e-book, Casey and The Amazing Gaint Green Shirt. The sacrifices of the men and women in the armed forces do not go unnoticed. Ninty-eight percent of survey respondents described themselves as "appreciative and thankful for the service and sacrifice of American military troops, their families, and American veterans." If you are an active duty, reserve duty military, retired military parent, grandparent, military spouse/ parent and would like to receive one e-book version of "Casey and the Amazing, Giant Green Shirt" (Ages 3 to Adults) as our gift, follow these steps. It is as simple as A, B. C.
A. Read this page. B. Complete the form. C. Click SEND. The form's "Thank you" page contains the link to the Casey story we are giving you as your Happy Birthday America gift. Read it online or download story. Read Casey and The Amazing Giant Green Shirt online with your favorite child OR/AND download the story's PDF and print a single copy for your own use. Read Casey and The Amazing Giant Green Shirt and discuss with your child. Autograph their book on page 27. Your name on this page will make your copy of Casey And The Amazing Giant Green Shirt priceless to the child. We are counting on you to help us get the word out. Thank you for your family's service to America. Casey and The Amazing Giant Green Shirts have been read by more than one million American children, teachers, and families. "America is free because of the brave." 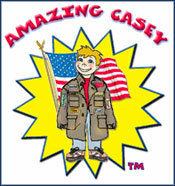 Casey And The Amazing Giant Green shirt outreach and the Kamaron Institute Positive Label Program has been commended by the White House, US Army and Navy family support services groups, and is the official citizenship story of the National Museum of Patriotism. Casey series books are also available for purchase on Amazon.com. Proceeds support the school programs of the Kamaron Institute Foundation. About The Form: Any registration information entered in the gift form is held in absolute confidence and forms are protected by a security program. We never share, rent, or sell this information. CLICK HERE FOR THE DOWNLOAD FORM. IMPORTANT: You will need Adobe® Acrobat® Reader® software to view and print the e-book. Click here to get Adobe® Acrobat® Reader® for FREE!